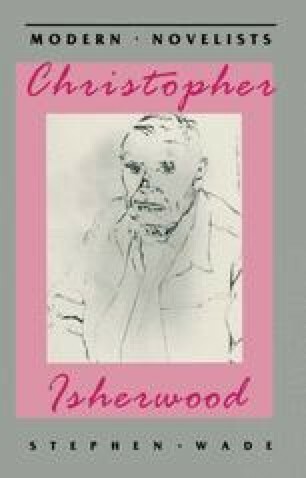 Isherwood’s writing career has often been seen by critics and literary historians as consisting of two distinct periods: the thirties European fiction and the post-war American fiction. Until recent full-length biographical and critical studies pointed out that his later work might be worth some consideration, the accepted view had been that the importance and the quality of his writing had declined as he insisted on scrutinizing issues of identity and homosexuality after Prater Violet (1946). Paul West, for instance, comments that when Isherwood tries to handle ‘moral significances’ he produces only ‘inflated pretentiousness’ and he also links Isherwood with Somerset Maugham as being ‘symptomatic rather than for the exposition of any message’.1 Similarly, Walter Allen, who had made a strong case for Isherwood as a novelist who reflected thirties concerns brilliantly, omits his American writing completely from his second major survey of the novel, Tradition and Dream (1986), and this is a study that sets out to survey the English novel since the end of World War II. If Isherwood has been classified as an American writer, then equally, he is noticeably absent from current surveys of American writing in that period also.